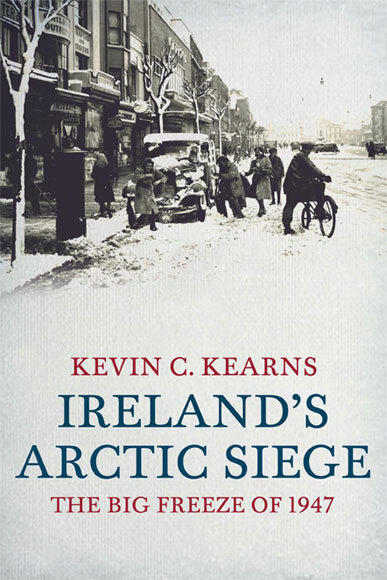 Ireland’s Arctic Siege, The Big Freeze of 1947, by Kevin C Kearns, Gill & MacMillan, 2011. We have suffered some long cold winters in Ireland in recent years but nothing on the scale of the winter of 1947, when an estimated 600 people died as a direct result of cold during one of the severest winters on record. Indeed the figures are probably much higher if we include those who died from an outbreak of influenza and the increase in TB deaths recorded that year. The bad winter was experienced all across Europe in the first three months of 1947. In Ireland there were snowfalls from early January to mid March followed by flooding in many rural areas. The knock on effects of the bad weather affected every section of the community. In his latest work, Ireland’s Arctic Siege, American historian Kevin C. Kearns examines the events and the impact of the winter of 1947. In 1946, British authorities warned of impending crisis in coal stocks. The coal industry was due to be nationalised on the 1st January 1949 under the control of the National Coal Board. In Ireland Taidgh Murphy T.D. announced at a meeting of the Galway chamber of commerce that there would be no coal stocks available from the U.K. until June 1947 and turf production would need to be increased by at least 40% to cope with this shortage. The problem of freezing temperatures was compunded by fuel shortage. The Irish government had reduced the price of turf in the budget in anticipation of the coal shortage. However a strike of hauliers in the summer of 1946 restricted the distribution of turf stocks and resulted in a smaller supply than anticipated. The relevance of this fuel famine hit home in January 1947 when Europe suffered one of the deadliest winters on record. The British were rocked by the coal crisis, which was compounded by heavy snowfalls and lack of transport, conditions quickly deteriorated. German miners in the Ruhr valley suffered extreme conditions of isolation, cold and even starvation. In Ireland both rural and urban communities have passed down the memories of the cold winter of 1947. Murphy’s warnings of coal shortage in the summer of 1946 may have appeared alarmist at the beginning of the winter season. Temperatures were considerably mild compared with the previous winter. In October favourable weather permitted rapid progress in farm work, many farms reported reaping and the sowing of winter wheat to be ahead of schedule. On November 6 the Irishman’s diary section of the Irish Times reported an overnight change of temperature of almost 20 degrees. Although this may have been an exaggeration it did reflect an unusual mild spell of weather. At this time Ireland had only a few meteorologists mainly employed in the aviation industry and there was no public forecasting system. Kearns refers to the insufficient forecasting and the many weather prophets, which the daily papers relied upon for information. We may look back and sneer yet with our highly equipped weather stations of today the media still turn to the skills of a Donegal postman for snow forecasts. Kearns tells the story through a series of oral testimonies of those who lived through the appalling conditions. Describing the desperate shortage of fuel and the regular burning of furniture to keep warm. The rationing system was still in place since the ‘Emergency’ and tuberculosis was a major health issue throughout the country. The death rate during the two-month freeze doubled with the most vulnerable becoming the main victims of cold and hunger. According to many of the testimonies the Irish Government was unresponsive to the needs of the country, which was facing a serious national emergency. While officials busily denied the need to declare an emergency, they failed to utilise the Army and other resources to relieve the intolerable conditions that people were suffering. When eventually the government recognised the gravity of the situation the response left a lot to be desired. Seán Lemass in a radio broadcast to the nation asked people to ‘avoid the selfish practice of using off hour glimmer gas, and reduce their electricity usage.’ On the other hand the generosity of wealthy types such as the Talbot’s of Malahide were praised for having made trees on their land available for fire wood. The conditions were perilous and many accidents were recorded such as an eleven-year old boy hit by a skidding truck on Baggot’s Bridge and more serious cases like the discovery of the body of James Gallagher in Co. Leitrim who got lost in a blizzard on his way to a neighbour in pursuit of some turf. Blizzards and snowdrifts of over 12 feet were recorded. Many people were left stranded and isolated while thousands of livestock were killed by the cold and hunger. The winter of 1947 was indeed a great tragedy for many, but I wonder if Mr. Kearns has exaggerated the significance somewhat in order to sell more books across the pond. That said, it is a decent social history and clearly establishes the disparity between rich and poor in Ireland at the end of the 1940s. The crisis created by the bad winter only served to highlight this disparity and certain indifference by some in authority. The book is longer than it needs to be and annoyingly repetitive however it sold out rather quickly in the run up to Christmas and has already been reprinted due to demand. It will make you appreciate your central heating and double glazed windows and perhaps we should take note that death in cold winters is unfortunately not yet a thing of the past. Irish Times 6 November 1946. Irish Times 8 January 1947. Irish Times 31 January 1947. Kevin Kearns, Ireland’s Arctic Siege (Dublin, 2011) p.166. Written by: Rhona McCord on 8 February, 2012. 4 Responses to "Book Review: Ireland’s Arctic Siege"
Where could I purchase this book ?